Peapod Pilates (prenatal pilates) - CoreBody Pilates + Yoga Inc. Many of the Pilates exercises can be used to benefit the expectant mother, enabling her to maintain good posture, and alleviate some of the recurrent aches and pains, as her body changes through each stage of the pregnancy. In both pre & postnatal classes the core foundational principles of Pilates will help to improve core strength, pelvic floor strength, postural alignment, balance, breathing and relaxation. 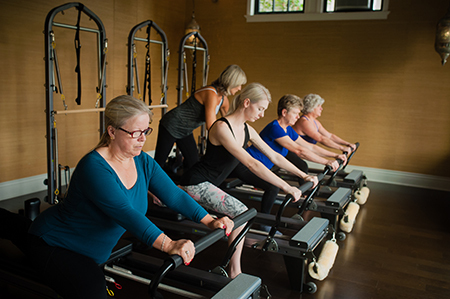 Performing certain Pilates exercises on the reformer, cadillac, and split-pedal chair, machine based “apparatus” pilates is the most effective and safe type of pilates when expecting. The machines allow prenatals to stand, kneel or sit and to continue exercising after their 1st trimester. This workout incorporates bilateral, unilateral and reciprocal movement variations to help challenge core stability and balance muscular strength. Specific modifications will be necessary as the posture changes, and the relaxin hormone is produced by the end of the first trimester. With the apparatus’ spring-loaded resistance, the focus is on specific breath patterns, and proper alignment. All new prenatal clients are required to submit a doctor’s (or mid-wife) note prior to an assessment and or joining a group class stating that you have been experiencing a healthy pregnancy thus far and you are permitted to join a prenatal apparatus based private or group class for the duration of your pregnancy. Having run CoreBody in Edgemont for 14 years from 2003 – 2017, we have seen a LOT of prenatal clients and have had a lot of “CoreBabies” born to CoreBody over the years! (My very first prenatal client’s daughter is 14 years old and taller than me)! 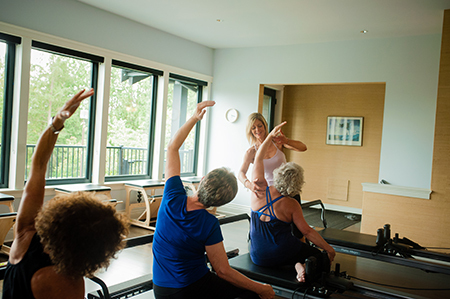 We look forward to working with you in our Deep Cove space. 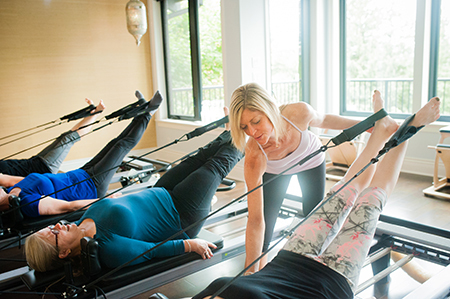 We run our prenatal apparatus based Pilates in a private or semi- private or group environment. Group classes will run when we have 3 clients minimum to form a group environment. Those interested in a prenatal private assessment and or group class should contact Stephanie Roberts by email at nvcoregirl@gmail.com or phone the studio at 604-916-9335.